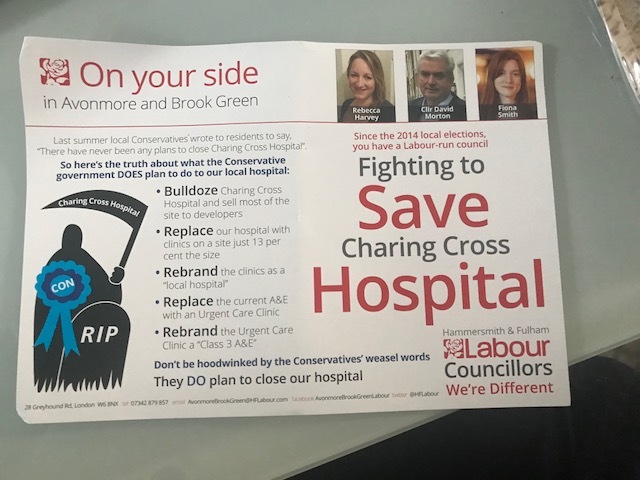 Last week local residents started contacting me because they had received a Labour election leaflet claiming that the Conservatives plan to “bulldoze” Charing Cross Hospital. The leaflet depicted Conservatives as the Grim Reaper – a bringer of death. The depiction of Conservatives as the grim reaper is deeply offensive to myself and my colleagues. So much for Labour promising kinder and gentler politics. Below I have set out an update on Charing Cross hospital and present our commitment to local residents on Charing Cross Hospital. But please bear with me while I make two more comments on the Labour leaflet. Labour’s Leaflet scares vulnerable people and undermines democracy. Firstly, some people have contacted me as a result of this leaflet, actually scared that the hospital might close. These are people who use the hospital and are scared about what they would do – some of them, older and vulnerable people. The fact that Labour is happy to casually scare people like this, in order to win votes, is in my view, callous. So much for concern for vulnerable individuals. Secondly, if local parties don’t stick to the truth, and enable voters to make up their own mind about the different parties’ policies and priorities then you don’t really have a democracy. Misrepresenting your political opponents with such a cavalier disregard for the truth undermines democracy. And where do we go from there? This dates from January this year and is an official presentation made by the “Imperial College HealthCare NHS Trust” to local council authorities. 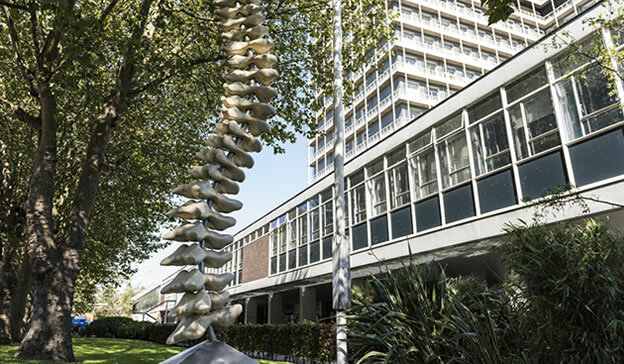 Over the past 18 months, some £6 million has been spent on major new developments including: Riverside theatres; main outpatient clinics; a new acute medical assessment unit; our first patient service centre; and the main new facility for North West London Pathology. As part of our investment in urgent and emergency care services and theatres at Charing Cross, we have co-located our acute medicine beds on the ground floor of the hospital, near to the A&E department, and closer to the imaging department. This has enabled medical patients to be admitted more quickly. Firstly, we commit to bringing you accurate and sourced information. We will monitor Imperial Trust’s reports and publications and get relevant items out to you. Secondly, we will consult you. I think the Cycle Superhighway planned for Hammersmith is an good example of our approach here. Our first leaflet on this matter was entirely neutral and simply pointed local residents to the information – something TfL with their huge budgets had largely failed to do. We spent many hours leafleting local streets simply to get information to local people so they could make up their own minds. Thirdly, we will represent you. If and when Imperial Trust comes out with a new round of proposals and consultation we will be led by what local people think. It is entirely evident to all of us that residents regard our local hospitals as hugely important. But the details of any plans are also important and we will seek to transmit to you these details, and then to understand, and then represent your views. Above all, I expect almost everyone reading this and all the local Conservatives will fight to retain, upgrade, and improve our local hospitals. Thank you for reading and all comments and feedback, as ever, appreciated. Email me at carolineffiske@gmail.com. Local GPs are reminding residents in Hammersmith & Fulham that it is easier to make a GP appointment at a time that suits them, including evenings, weekends and bank holidays. Residents can pre-book GP appointments from 8am-8pm seven days a week and practice nurse appointments on weekday evenings and Saturdays. These hours are in addition to existing GP services, meaning that residents now have access to primary care from 8am-8pm seven days a week. Any patient registered with a Hammersmith & Fulham GP can access these appointments at three practices across the borough. Appointments can be booked at any one of these practices through your local GP practice or by calling NHS 111 when your GP practice is closed. This means Hammersmith & Fulham residents can make an appointment with a GP or nurse at a time and in a place that is convenient for them. reduces avoidable A&E visits and unscheduled hospital admissions. You can book an appointment from your own practice with a GP at 3 practices across the borough in the evening or at the weekend. During your practice’s opening hours, you can call and book an appointment at one of these sites for an evening or weekend appointment. On Saturdays, at all sites, pre-bookable Practice Nurse appointments are also available which can be booked through the patient’s registered GP practice. Why does Hammersmith and Fulham Council ban vaping? Research has established that there are no health risks from “passive vaping”. There is no law against vaping in public places. It is a highly effective method for smokers to give up. Yet Hammersmith and Fulham Council bans vaping on its premises – without being able to give any proper justification for doing so. “I was concerned to see from this FOI response that “staff and visitors are expected to vape outside” from Council premises. Please note that Public Health England argue that we should make a distinction between smoking and vaping.